Maheshwari Sarees are glamour personified! Majestic their designs, Maheshwari sarees are woven from silk and cotton fibers. The saree is well known to have the golden border and zari work. 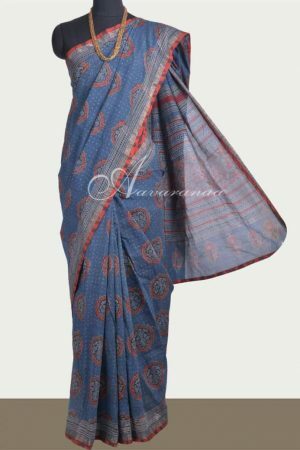 If you too, are fan of Maheshwari sarees, or are planning to buy one, Aavaranaa is the right place for you. We have a vivid range of Maheshwari designer sarees, which will bring out an elegant traditional style evoked by you. 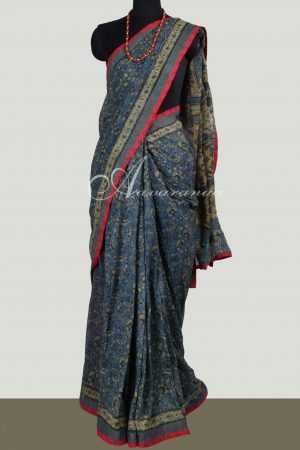 The Maheshwari silk sarees available online at Aavaranaa iare highly comfortable and are known for their magnificent quality. The designs of these sarees are alluring and unique. Our creative craftsmen use amazing designs of Laheriya, Bunti, Borders, Parcha and Jaal, which gives a dazzling look to the wearer. These sarees are designed after great research, done by our designers, of the current fashion trends and customer demands in the market. Also, we have Maheshwari printed sarees in cotton fabric available at our online stores, which along with giving comfort embellishes the look of the Indian attire. The sarees are made more attractive, as our designers have given a distinct touch to the Pallu of the saree. The Pallu is designed exquisitely and accentuates the beauty of a saree. Maheshwari sarees are good to wear at festivals, important meetings, get-to-gathers or some special occasions. Be proud and rejoice the feel of being an Indian woman. The variety of Maheswari sarees available at Aavaranaa will increase your love for sarees and will tempt you to have more and more added to your wardrobe. Avail the time saved in Maheshwari sarees shopping by doing it online with us. You have the best quality at the best price. Celebrate being a woman, look traditionally gorgeous.